In the morning, Wake Forest University sophomore Jay Sherrill rides the D.C. metro to Capitol Hill to work on trade policy briefs for a subcommittee of the House Ways and Means Committee. In the evening, he shares his first-hand experience with classmates in his “U.S. 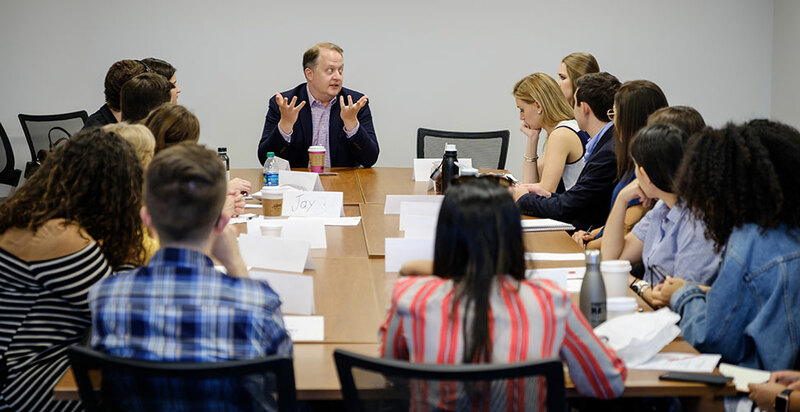 Policymaking in the 21st Century” class at the University’s new Wake Washington Center. 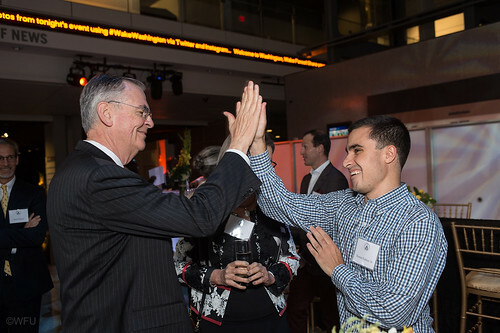 Sherrill is one of 16 students in the inaugural cohort of the new Wake Washington program, a semester-long study away program combining internship and academic experiences in the nation’s capital. 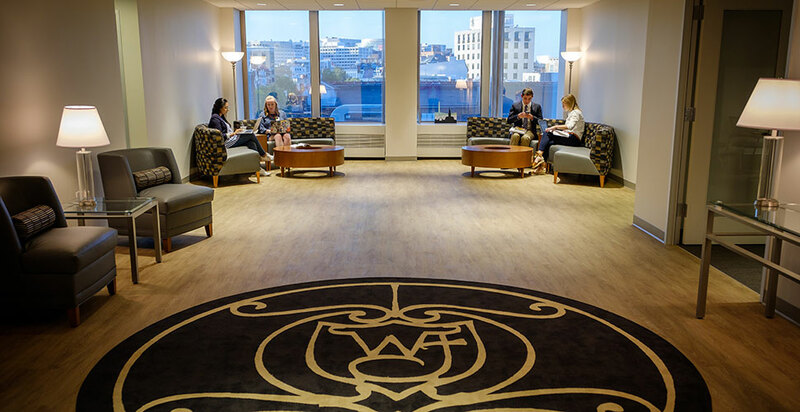 The Wake Washington Center opened this fall at One Dupont Circle – a centrally located, instantly recognizable address – as a new home base for the thousands of Wake Forest alumni who live in the Washington area and the increasing number of students who plan to work or study in D.C. after graduation. The University is hosting open houses of its new space on Oct. 13 and 14. Wake Forest students are learning through internships at the Senate Committee on Indian Affairs, the Office of D.C. Council Member Mary Cheh, the Heritage Foundation, the U.S. Asia Institute, the Kennedy Center, the International Rescue Committee, the German American Heritage Museum, the Carmen Group, the Century Foundation, the White House Historical Association and the Office of Congressman David Price. 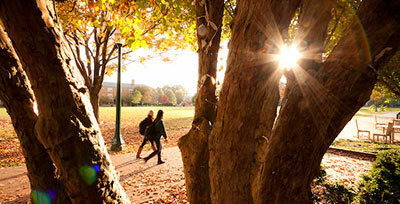 16 students, all paired with alumni or parent mentors, are participating in Wake Washington this semester. Monday through Thursday, students work in full-time internships ranging from the White House Historical Association to the Kennedy Center. 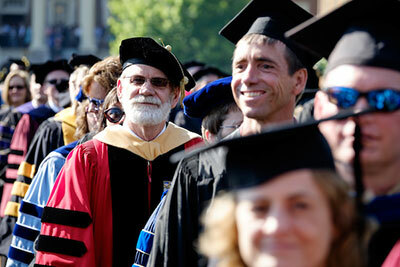 Two nights a week, students take classes – “U.S. 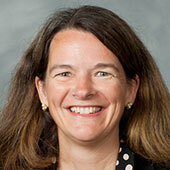 Policymaking in the 21st Century” and “American Constitutional Law: Separation of Powers and Federalism” – taught by faculty director and politics professor Katy Harriger. On Fridays, students hear from a series of guest speakers and make field trips to Washington landmarks. Brianna Reddick, a junior who is exploring political journalism and communications as an intern with the Century Foundation, has already written an article published on the Foundation’s website. 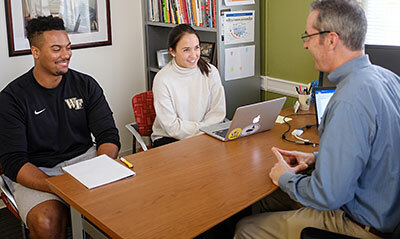 Students work at internships four days a week and spend Monday and Wednesday nights in classes taught by faculty director and political science professor Katy Harriger. 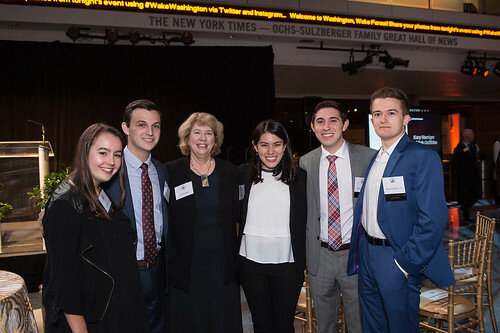 On Fridays, students get the scoop from Washington insiders on everything from think tanks to pollsters to fake news during guest lectures and field trips. 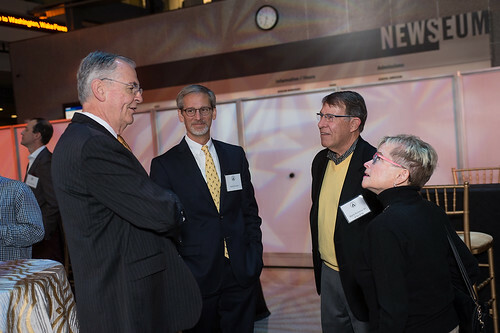 In recent weeks, they toured the Pentagon with Surgeon General of the U.S. Navy Forrest Faison (’80); listened as Donna Edwards (‘80) reflected on her time at Wake Forest and her time in Congress; and heard Grover Norquist, president of Americans for Tax Reform, speak about the current tax reform debate. They will also visit the Washington Post, the new National Museum of African American History and Culture and other D.C. landmarks and institutions. 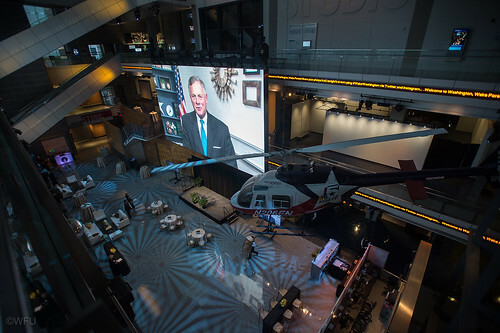 The 4,300 square-foot Center is situated among think tanks, research institutions, museums, non-profits and government agencies, many of which provide experiential learning opportunities for Wake Washington students. The building is owned by the American Council on Education (ACE) and houses many higher education organizations and non-profits. 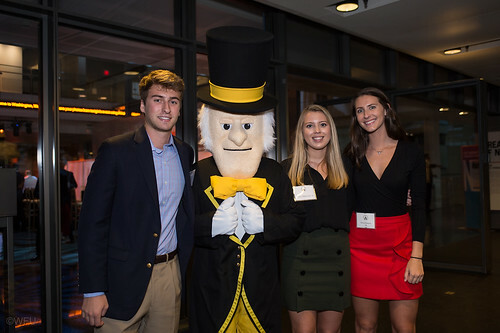 Wake Forest is the first ACE member institution to have space in the building. Students meet in the lobby of the Wake Washington Center before class. 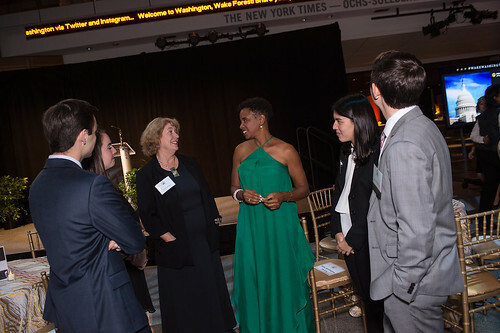 The Center will host alumni-to-student virtual panels to help students who want careers in D.C. so alumni can share with current students their knowledge and contacts for working in federal agencies, think tanks, non-profits and other fields. Shane Harris ('98), a reporter for the Wall Street Journal based in Washington, talks about his career with students. 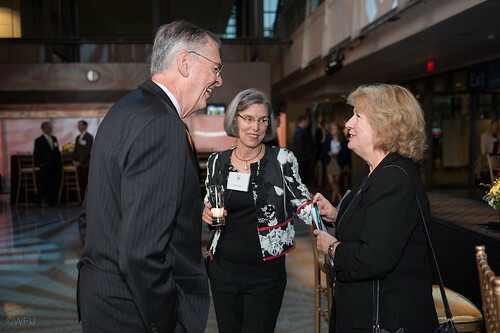 Wake Washington will also be a place for networking events and meetings for alumni and parent volunteers. 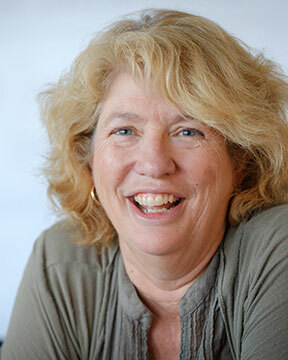 Harriger is teaching workshops this fall for alumni and parents at the Center on topics including the Supreme Court, deliberative dialogue, and special prosecutors. 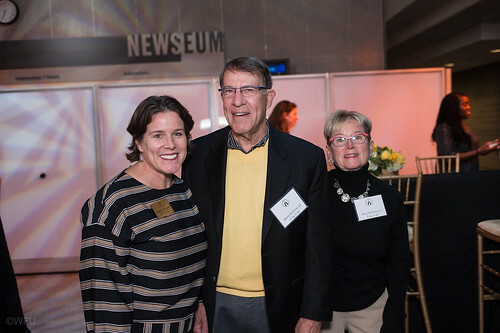 Learn more about the launch of Wake Washington and the opportunities the University will provide in D.C.
Wake Forest celebrated the official launch of the Wake Washington Center with an Oct. 12 event at the Newseum and open houses in the Center’s home at One Dupont Circle. 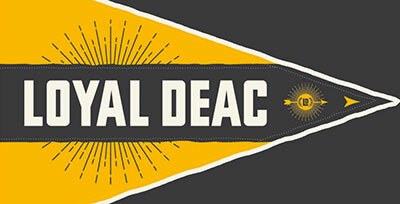 This week in D.C. Wake Forest is participating in the first “ACCelerate: ACC Smithsonian Creativity and Innovation Festival.” Presented by Virginia Tech and the Smithsonian’s National Museum of American History, the ACCelerate Festival is three-day celebration of creative exploration and research at the nexus of science, engineering, arts, and design. The event (Oct. 13-15) features 47 interactive exhibitions from the 15 Atlantic Coast Conference schools, including four Wake Forest projects.